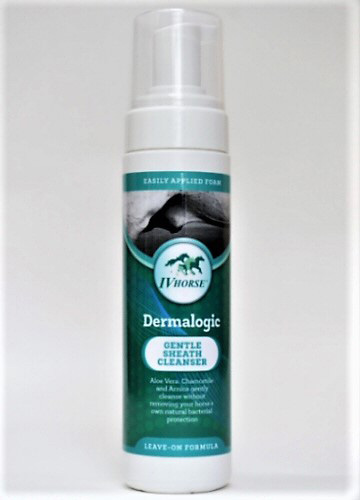 Dermalogic Gentle Sheath Cleanser from IV Horse. The combination of Aloe Vera, Chamomile and Arnica will gently cleanse without removing your horses's own natural bacterial protection. The foam constituancy of this cleanser makes it easy to apply without the need to wash out. Gently massage in the outer sheath area to remove smegma and debris. Can be used in a liquid form if desired. Do NOT use this product if sheath appears infected or requires veterinary attantion. Do NOT force too deeply into sheath area.